Not all eggs are created equal in the eyes of U.S. Customs and Border Protection. Kinder Eggs, a popular European chocolate egg that contains a toy inside, is banned from importation into the United States because it contains a "non-nutritive object embedded in it." With the Easter holiday around the corner, the agency issued the reminder this week, warning that the candy is considered unsafe for children under 3. Last year, Customs and Border Protection seized 25,000 of them in 1,700 incidents. The hollow egg, which is sold by the Italian confectioner Ferrero, is available in Europe, Canada, Australia and parts of Latin America under various names including Kinder Surprise and Kinder Sorpresa. It has taken on a cult status among adults who collect the toys, which vary from rings to animals and cartoon characters. Kinder Eggs' scarcity in the United States has made them an object of desire: Various websites and online forums are dedicated to acquiring them. Some are apparently hiding in plain sight. Earlier this week, DNAinfo.com, a New York City neighborhood guide, posted a story and slideshow showing stores where the coveted treats can be found. "While there are some commercial-sized seizures that occur, most Kinder Eggs are seized in personal baggage or at mail and express consignment facilities," Customs and Border Protection said. A Canadian woman reportedly learned her lesson the hard way. The woman was selected for a random search at a border checkpoint in Minnesota when officials discovered she was carrying a Kinder Egg and took it from her, The Toronto Star reported. A few weeks later, she received a 7-page letter asking if she wanted the egg back or if she was going to abandon rights to it, the Star reported. "I was in disbelief," she told the newspaper. "It's a $2 egg." Filed under: Food • Holidays • U.S.
Just one more small joy taken from us by the government. And why at Easter? Come onnnnn! I can get my concealed carry permit without hassle, but a Kinder Egg- don't be crazy! The government can stuff it with all these Nanny laws. We don't need you and we especially dont need your crap control. Yes, bow down to government, lick thier boots! This morning my son poured himself a bowl of cereal and a non-nutritive object fell out. Had I not been so alert he might have choked on this plastic encased toy car. Who do I complain to about this flagrant disregard of the law by cereal companies?. Or does the law only apply to foreign made Spring Spheres? Oh thank goodness we have such a loving, caring government. They give me "love pats" at the airport, invest 40 percent of my income for me, and they make sure I can't drink those "evil" fruity drinks, or those "sinister" chocolate eggs. Ah, to have such a loving, caring, giving government. I just wish others around the world could experience the love and warmth of such a government. Oh wait...there's was one other country that got to experience that love and warmth. NAZI GERMANY UNDER HITLER!!! Yay goodwin's law strikes again. You can freely buy them at many of the Polish delis in the Chicago area. I bought 6 yesterday and no one confiscated them from me. Well thanks Megan, now the Gestpo Kinder Egg Police will be raiding the Polish establishments and deporting these vile law breakers! You can buy them everywhere, actually. Why was this story written? There is no ban! I have a son-in-law who has a German Mom and an American GI Dad. He loves Kinder Eggs and collects the toys! I hate to think this is a tradition that he has to do illegally to pass on to his children! So many problems with this .... Wake up citizens and speak out!!! Americans are smart enough not to let this ideology continue but they must talk to their families, communities, social groups, fellowship groups, co-workers and ANY politician who will listen!!!!!! Yes better to eat American Chocolate – High Frutcose Corn Syrup, Corn Syrup, Corn Starch, Food Coloring, Dye, Preservatives and don't forget American Chocolate by law may contain residual mouse droppings! Chocolate is chocolate. Made out of the same stuff. Nice try Dan. @Frankenstein - chocolate is chocolate? or not. When was the last time you looked at or understood ingredients? @blah blah blah - can't be bothered but you took the time to comment? Wow, that is crazy! 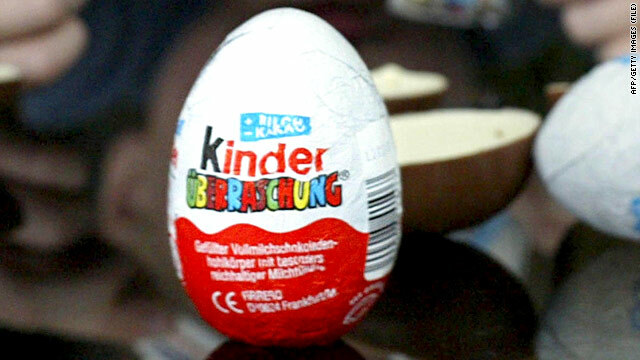 They totaly ripped off the kinder egg but as was posted earlier, because China (known for all their kid friendly products) makes them, they are totaly legal to get? What a croc of you know what! I have to wonder if the big wigs in our government have major holdings in China and after they totally liquidate America, they plan to flee to China? OK, so I don't think a ban of these is in order, but saying they should be OK because there are plenty of things dangerous to a 3 year old like drain cleaner is stupid. OF COURSE there are lots of things dangerous to kids available, but drain cleaner doesn't come packaged in a way to entice kids to drink it. I assure you if it was packaged in little foil packs like Capri Sun and a smiling kid playing with bunnies was on the package, it wouldn't be on the shelf for 5 minutes before being banned. Theres a store down the road from me that sells these. We buy them there all the time. The toys are a hoot. Obviously they are not that hard to get if we can buy them in Cleveland, Ohio. Ve haf our vays to enforce diese laws. If sie ist caught mit eine 'killer egg' sie can be sent zu der Koncentration Kamp! Did I say Koncentration Kamp? I meant zu sayin Happy Kamp! Das is vere ve send der parents of dumbkoff Amerikanish people zu learn how zu chew prpoerly. for one thing, the toy is inside of a yellow container, inside of the egg. not just hanging around in a piece of chocolate...If remember correctly, the containers were EXTREMELY freakin difficult to open, to get your toy. As a kid growing up in Germany, i had to fight with darn the things to get them open, usually failing and having to ask my parents to open it for me. USA needs to take a giant chill pill... and parents, just watch your kids. Kinder eggs are a combined communist/Al Qaeda plot to choke our children! Seriously,it is nearly impossible to choke on the toy inside, it is encapsuled in a plastic egg that is too big to choke on. Its funny that we are the only nation to ban these things. What does that say about our perceived intelligence level?